Below is some brief information that you will need to know about the 2019 soccer season. Our season starts on March 4, 2019 in the Varsity locker room at Central. We will meet there at 7:30 to talk for a few minutes and then we will be having practice to follow. We will be running a two mile run so bring running shoes. One thing that you need to know is that before a PLAYER MAY PRACTICE THEY MUST HAVE A PHYSICAL, HEALTH INSURANCE, AND ACTIVITY CODE signed and completed . Players can bring this paper work to any of the coaches at the first practice. The practice location will vary from week to week. We alternate between McCormick and Riske. In the case of inclement weather, we will have practice indoors. 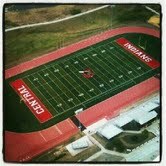 Indoor practice will always be in the Central Field House; however, indoor times will vary. Please refer to the schedule posted on the website for the most current practice and game information. It is also of the players best interest to bring the proper practice gear. We all know how the weather in Wyoming can change in an instant. Things that must be included in your bag are cleats, indoor shoes/running shoes, socks, shin guards, warm clothes (pants, coats, gloves, ect), both a light and a dark colored shirt for scrimmage purposes, and last but not least a water bottle!! Please click the "SCHEDULES" link to access all of the CHS Athletics schedules.